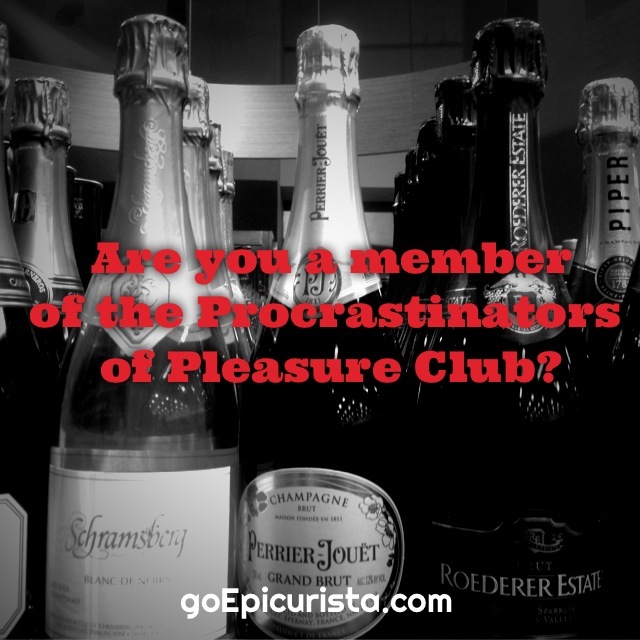 Are you a member of the Procrastinators of Pleasure Club? Do you put off for someday the enjoyment of today? Let’s find out if you’re a member of the Procrastinators of Pleasure Club, shall we? How often have you said this to your friends? “We need to get together someday soon and catch up” Only to see months go by and you have yet to see each other. Does this sound familiar? “We need to try that new restaurant one of these days” Only to see the restaurant close down before you ever got a chance to try it. How about this? “We can’t drink that nice bottle of champagne. We’re saving it for a special occasion” And then, that nice bottle of wine sits in the wine rack for years (when you weren’t intending to age it) and it ends up turning to vinegar. Maybe you’ve said this one? “I’m going to make recipes from one of my cookbooks and throw a nice dinner party someday when I have time to put it together” And then you find your cookbooks gathering dust on the shelf, yet to be cracked open. If you answered “yes” to any of the above statements, then you, my friend, are a member of the Procrastinators of Pleasure Club. Welcome! I have said these phrases and similar ones many times. I’m sure you can think of other things you say which delay enjoying life to the fullest, can you? I was the Queen of the “we’ll do that someday”. My name is Christina and I’m a member of the Procrastinators of Pleasure Club. According to The New York Times article “Carpe Diem? Maybe Tomorrow” by John Tierney, “this is actually a widespread form of procrastination” which tells me we are not alone in this foolish behavior. I have no idea why we do this. It makes no sense why we would delay doing things that would surely bring us joy. This is what I know for certain: “someday”, “sometime”, “one of these days”, “save it for later” all have one thing in common. They are NEVER going to happen. Not unless we make a deliberate change, make a plan and MAKE IT HAPPEN. This year, I skipped the traditional New Year’s Resolutions. You know the ones. Lose weight, exercise more, eat healthy, get more sleep, and so on. Most of us make them and break them before the month of January is over. Instead my resolution is to ban the word “someday” and all its synonyms from my vocabulary, cancel my membership in the Procrastinators of Pleasure club and make “someday” a reality. Live each day as the special occasion that it is. With every sunrise we receive a gift, another chance to live life. Yet most of us think we can save that gift for later. All I can say with certainty is that once today is gone it’s gone. Our “someday” is not guaranteed. Life is short. Yet why do we keep waiting for a “special occasion”? Isn’t life special occasion enough? In a nutshell, I’m going to do today the things I have been saying for years “I’m going to do that someday”. I dare you to go ahead and drink the good wine, use the fine china, take the nice glasses off display, use the decorative towels in the bathroom (you know who you are with the pretty towels no one can touch), but most importantly take time to get together with friends, make a reservation for that new restaurant you’ve been wanting to try, take that trip you’ve always dreamed of, and make “someday” a reality. You can always buy another nice bottle of wine and new decorative towels for that “special occasion” when the time comes. I promise the store won’t run out! Now that we have admitted we have a problem. Our next step is to identify what we are going to do to fix it. Experts recommend that to stop procrastinating you need to identify what you want and devise a plan to get there. 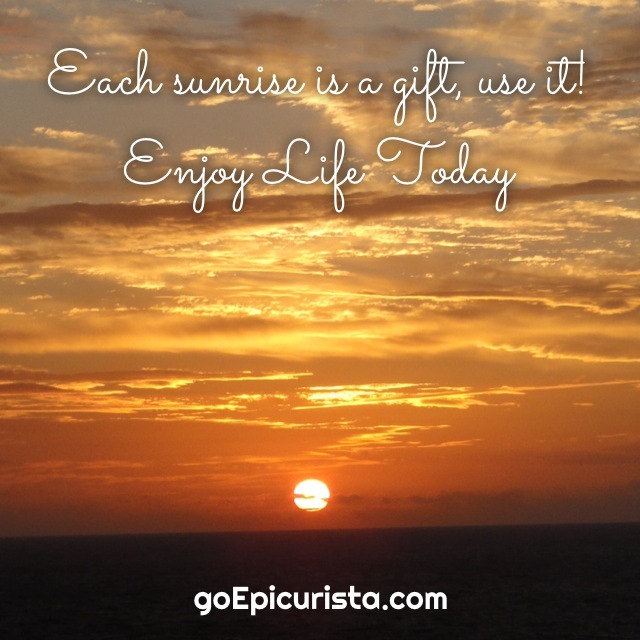 My resolution is to celebrate life today and goEpicurista. Are you convinced to revoke your membership in the Procrastinators of Pleasure Club? Are you ready to make your “someday” a reality? Then join me and goEpicurista today by signing up in that handy little box on the right side of the page! You may ask what does this have to do with a food and travel blog? 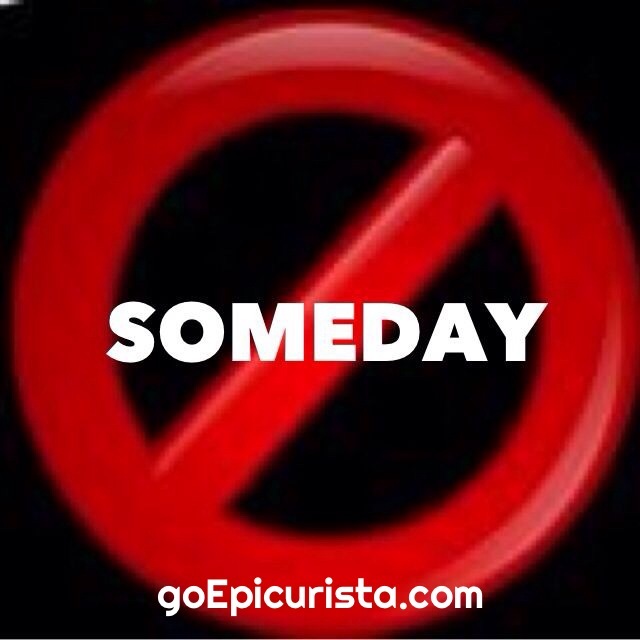 goEpicurista.com is my platform to make someday a reality. To celebrate great food, wine and friends everywhere I go. My mission is to create experiences that will allow me to reconnect with my friends and that will inspire you to do the same with yours. Any day can be a celebration if you have great food, wine and friends. Friends being the most important ingredient. Join me on my journey and we can do this together. It will be much more fun! I will share fun ideas and party planning tips for Easy Entertaining at home. If you prefer to go out on the town, I have plenty of special outings ideas, recommendations and reviews for great places, restaurants, and foodie events that provide the right experience for friends to get together and enjoy life. And when you want to get out of town, I have travel ideas, tips and must-see places for vacationing with friends. My goal is for you to revoke your membership in the Procrastinators of Pleasure Club and make someday a reality.